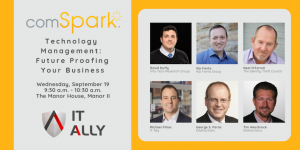 EAdirections will be participating with some of our fellow IT Ally experts in a panel discussion Wednesday, Sept. 19, 2018 at 9:30 entitled “Future Proofing Your Business” at the Manor House in Mason, OH. We will be discussing several aspects of what it takes to “future proof” a business. While many companies continue to think of “future proofing” as a means to make your current business withstand the pressures of time and aging, those that have achieve a measure of Business Agility view it as a means to understand and dealt with the fact that components of your business will have to be eliminated and/or replaced. Our Business Agility Test (created in partnership with IT Ally) can help you discover some insight into your company’s level of Business Agility. Click here to get more information about one of the biggest Technology events in the Cincinnati area. « Previous Post: Is your Business Agile Enough to Survive? Take our Online Assessment.